To mark the 10th anniversary of Master Shen Yen's passing, DDM is organising a ceremony that reflects the core spirit of “the rising great compassion with continual vows”, to inspire devotees to arouse a compassionate mind in continuing to carry on Chinese Buddhist traditions and share DDM’s vision, as an effort to help illuminate the light of Dharma throughout the world. Besides expressing gratitude and show remembrance of the Master’s guidance, the event will be an opportunity for practitioners to meet together in the Dharma and jointly make the vow to become facilitators of Dharma propagation, based on the Master’s teachings and DDM’s ideals. It will also be an occasion to raise their awareness of the urgent necessity to practice diligently as the prerequisite for sharing the benefit of Dharma with others. 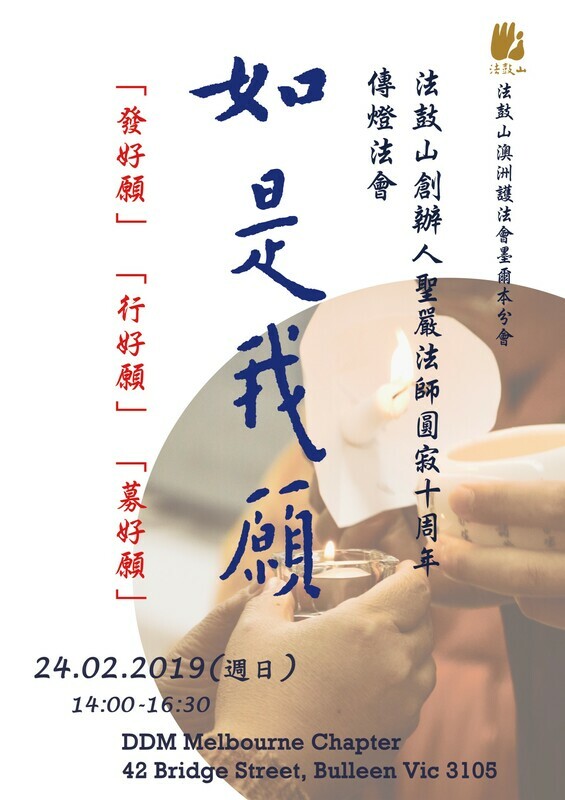 By continuing the wisdom life of Master Sheng Yen, passing on the lamp of wisdom with a pure mind, and beating the Dharma drum, participants can help illuminate the world with the brightness of the Dharma. As the Master once said, he never expected our gratitude or appreciation toward him as a teacher, but nevertheless hoped that each and every of his disciples can become a lamp for the world by shining the light of Buddhist compassion wisdom far and wide. The annual Day is meant to remind us to refresh our initial aspiration when embarking on the Buddhist practice, and to always remain grateful for encountering an accomplished who guided us with his insights for the benefit of our life. Now, we wish to apply the practice method of Buddha-name recitation, to commemorate and show our gratitude to Master Sheng Yen for his kindness.